On a blustery day in 1778, Captain James Cook sailed into Waimea Bay on the Island of Kauai, the first European to have reached the Hawaiian Islands. He named the archipelago the Sandwich Islands after the Earl of Sandwich. Thankfully, the name did not stick. While he is credited with their “discovery”, the Islands were already inhabited and had been for many years by members of the Polynesian race who sailed the Pacific in their sleek ocean going canoes navigating by the wave patterns and the stars. The name “Hawaiian” is said to have originated in the legend of Hawai’iloa, the Polynesian navigator credited with the original discovey of the Islands. Kauai is the northern most inhabited island in the Hawaiian chain. As with all the Hawaiian Islands, Kauai’s origin is volcanic. It is also the oldest. The archipelago was formed as molten rock oozed up through the Hawaii hotspot of the Pacific Tectonic Plate. Since the Pacific Plate is sliding WNW, it has carried Kauai and the other Islands in that direction. Kauai is the fourth largest of the Islands and is known for its lush vegetation and is often referred to as the “Garden Isle”. Towards the center of the Island, the former bowl of the volcano, an annual average of 470 inches of rain is received compliments of the moisture saturated air. This huge volume of water produces numerous scenic water falls that attract tourist the world over. “Jurassic Park” falls as it is now called was where parts of the motion picture was filmed, one of the more than 70 films (including the musical “South Pacific”) made on Kauai. Oddly, the Island is populated by thousands of “wild chickens” (or “Moa” in Hawaiian) ancestors of chickens that escaped from Polynesian settlers many years ago. They are everywhere as they have few natural predators. The locals just ignore them pecking about. Many plant and animal species are endemic to the Island and afforded protection. 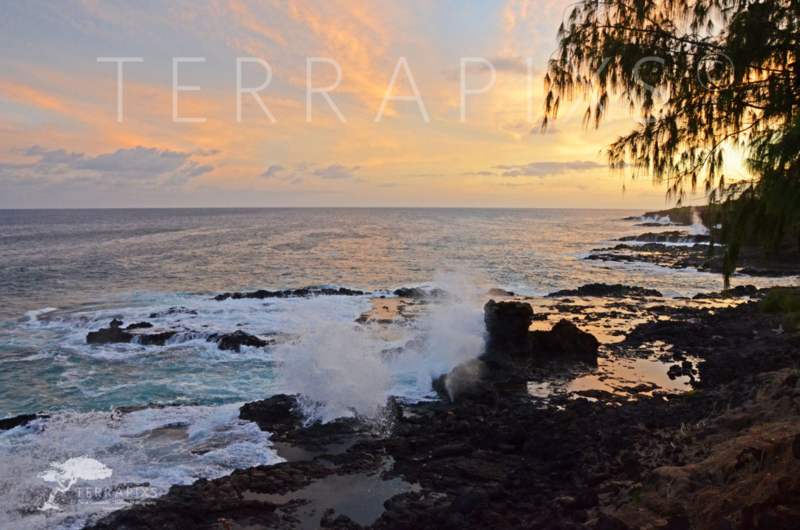 The picture above was taken at Spouting Horn Park along the south side of the Island. Ancient Hawaiians legend says that this coastline was once guarded by a giant moo (lizard) named Kaikapu. The moo would eat anything or anyone who came near so people feared him. One day a young boy named Liko jumped into the ocean to outwit the moo. Kaikapu attacked him but Liko thrust a sharp stick into the moo’s mouth and swan under the lava shelf and escaped. Kaikapu followed but got stuck in the lava tube. To this very day, you can hear Kaikapu’s roar and see his breath spraying through the blowhole. Enjoy and never stop learning!